Be the first to share your favorite memory, photo or story of Ila . This memorial page is dedicated for family, friends and future generations to celebrate the life of their loved one. Ila passed away November 13th, 2018 just 11 days short of her 93rd Birthday. Visitation will be at the Central Christian Church in Boone, Iowa on Monday, November 19th from 5 to 7 p.m. A Memorial Service will be held on Tuesday, November 20th at 11:00 a.m. at the church, followed by a lunch. Ila Hegwood grew up in Des Moines. She worked various jobs, where she was nicknamed “Blondie.” She married Max Bell; and in 1961 they and their daughters, Beverlee Bell and Karen Bell-Hanson, moved to Boone. In Boone, Ila volunteered with her daughters’ camp fire groups and even went camping, except she stayed in a trailer, while her daughters stayed in a tent! 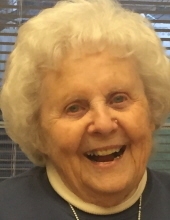 She was in a Jills of Arts group, a quilting group, served as President of the Bryant PTA and the Boone Camp Fire Group. Ila volunteered at Central Christian church in Boone, often running the kitchen, serving funeral lunches and many other group meals. Ila spent her last 17 years living in the Madrid Home Retirement Community, where she was loved and well cared for. Wherever Ila was, there was sure to be laughter. She expressed directly what she thought and wanted, but with a smile. She was also quick to thank and praise others. The twinkle in her eyes, her smile, and her laughter will be missed by her daughters, her son-in-law Jeff Bell-Hanson, her chosen family Stephen, Beth and Rachel Gaul, as well as her nephews, nieces and several friends. Ila was preceded in death by her husband, Max. To send flowers or a remembrance gift to the family of Ila Bell, please visit our Tribute Store. "Email Address" would like to share the life celebration of Ila Bell. Click on the "link" to go to share a favorite memory or leave a condolence message for the family.